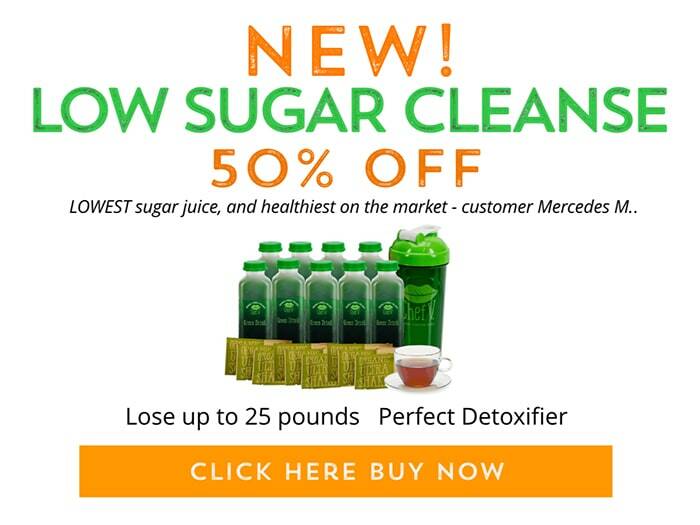 Thinking about doing a cleanse because you haven’t been eating healthy lately? If so, what’s the best way to get your daily dose of veggies: through juice or a greens powder? Here’s what the experts say…. Veggie Juice vs Greens Powder: Which Is Better For Your Health? If you’re thinking about doing a cleanse or just want an easy way to get more veggies in your diet, both veggie juices and green powders have become very popular. But if you have to pick one, which is better? I’m not going to string you along and have you wait with bated breath until the end to reveal the answer. 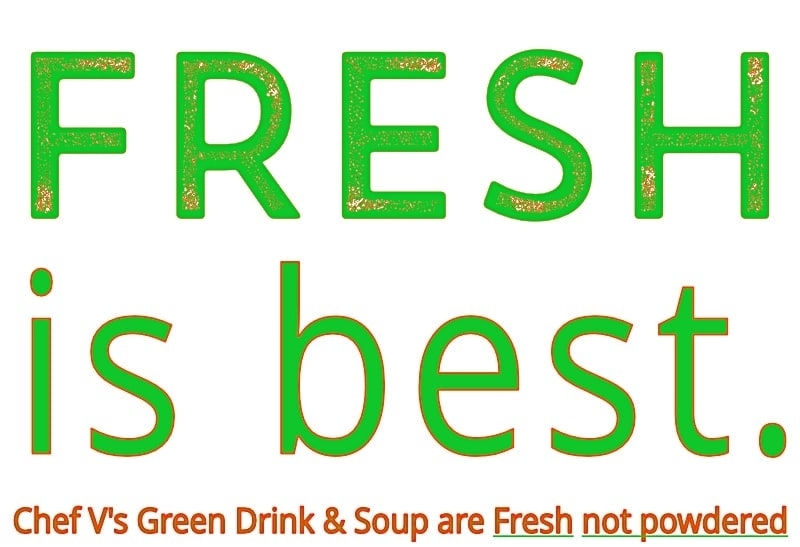 Especially cold-blended Organic Green Drinks. 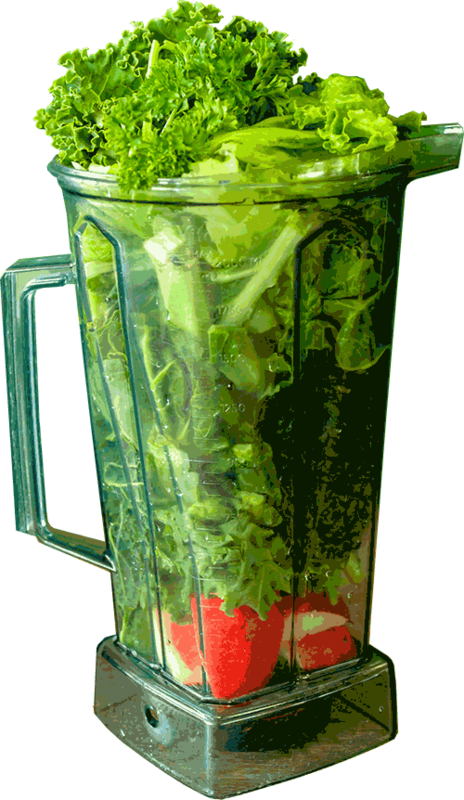 Here’s why veggie juice beats powdered Greens…. For starters, some powders may be poisonous. According to ConsumerLab.com, which is an independent research group that tests supplements for purity and labeling accuracy, some brands are tainted with heavy metals. Heavy metal is great if you want to do some head-banging while doing a CrossFit workout. But heavy metals are something you definitely don’t want in your veggies. ConsumerLab, in 2016, found that at least 3 brands were contaminated with heavy metal. Barlean’s Greens is one of the most well-known veggie powders on the market. ConsumerLab revealed that it contained 6 mcg (micrograms) of lead in each 8 gram serving. If you were to purchase a powder called, “Greens Organics + Superfood Raw” you’d probably feel pretty confident that it’s a safe, healthy product. However, ConsumerLab found that this product contained even more lead than Barlean’s (6.5 mcg per serving). The third product that tested positive for heavy metals was HealthForce SuperFoods Vitamineral Green. With that mouthful of a product name, you also get 3.6 mcg of lead and 13 mcg arsenic. One more brand of powder tested positive for poison: Naturo Science Green Food – Berry Flavored, which had almost 4 mcg of lead per scoop. While these test results were from 2016, I don’t know about you, but personally, I’d be very skeptical about trusting these brands again. Let’s give the benefit of the doubt to green powders and assume that the vast majority of them are not contaminated with heavy metals. Take that little inconvenient fact away and is it a toss up whether veggie juices or powders are better? Nope. Veggie drinks still come way out ahead…. Below, a blender from the Chef V kitchen ready to be made into Green Drink – yes, those are the fresh, organic ingredients you get from Chef V! Actually, if I may, a final word on contaminated powders: the problem might be worse. A recent U.S. News and World Report article says that one third of greens powders marketed as “healthy, healthy, healthy” were found to be contaminated with heavy metals. Yikes. When you buy green powder, who knows how old the veggies are? Some brands of powders freeze-dry the veggies. I don’t know about you but I never ever put any fresh veggies in the freezer, do you? So why would you want a powder of freeze-dried veggies. Can you imagine a restaurant in Italy serving pasta with freeze-dried tomatoes? Freeze-drying might be great for wild salmon. But freeze-drying veggies kills both the taste and the nutritional content. To get a powder to taste palatable, some brands will add sugar to it. 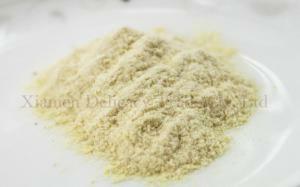 And many times, fillers such as soy lecithin or rice bran get added to powders to bulk them up. If you’re trying to lose weight and detox, the last thing you need is any bulking agents. And according to this article on GQ’s website, some powders include in the ingredients, “propriety blend.” Why is this a problem? The article explains that this is a loophole for the company to not have to list specific ingredients, such as a food coloring or other additive. Don’t you want to know exactly what you’re putting in your body? But when you buy veggie juice from a reputable brand (ahem, like Chef V) that uses veggies from their own organic farm (like we have) or buys fresh produce from an organic farmer (like I do) and cold-blends the juice on site (such as in our new store in suburban NYC), thus preserving the nutrients (yup, check … we do that), you know it’s a healthy product…. Not all green powders are created equal. That’s certainly true of green juices as well. In fact, the healthiest green powder is better than the worst juice cleanse. That’s because many juice cleanses out there hardly contain any veggies; they are mostly all fruit juice. 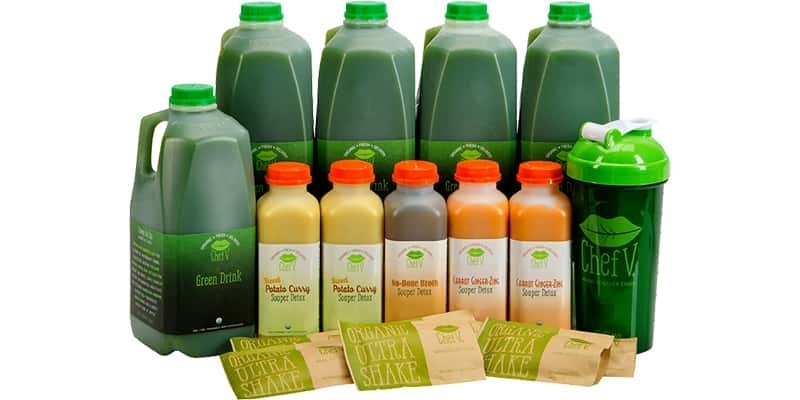 As Consumer Reports explains, there’s a major problem with many juice cleanse programs. First and foremost, the sugar content of many juice brands is sky high. See how Organic Green Drink–only 3 grams of sugar per serving–compares with the competition here. And if you’re looking to do a cleanse, there’s something else you should keep in mind…. Even if the veggie juice is super healthy, you’re going to need more than juice to keep you going. It doesn’t matter if it’s as little as a 3-day cleanse. Just having juice for 3 days will likely make you feel famished. You also need protein and real food to satisfy your belly. 1 (one) container of Detox Soup: Sweet Potato Curry or Carrot Ginger Zing: rich in protein and fiber, tastes like homemade because it is! Speaking of powder vs. fresh, there are some other cleanse programs out there that include soup. But some of the ones I’ve seen are powdered soup mix. I’ll put my homemade Detox Soup against powdered soup in a taste test any day! Look, I get it, powdered greens you can buy at a supermarket might seem like an easy way to get your daily dose of veggies. But powdered veggies is nowhere as near as beneficial for you as fresh, organic, whole food veggies. And besides, if it’s convenience you want, convenience you shall have. 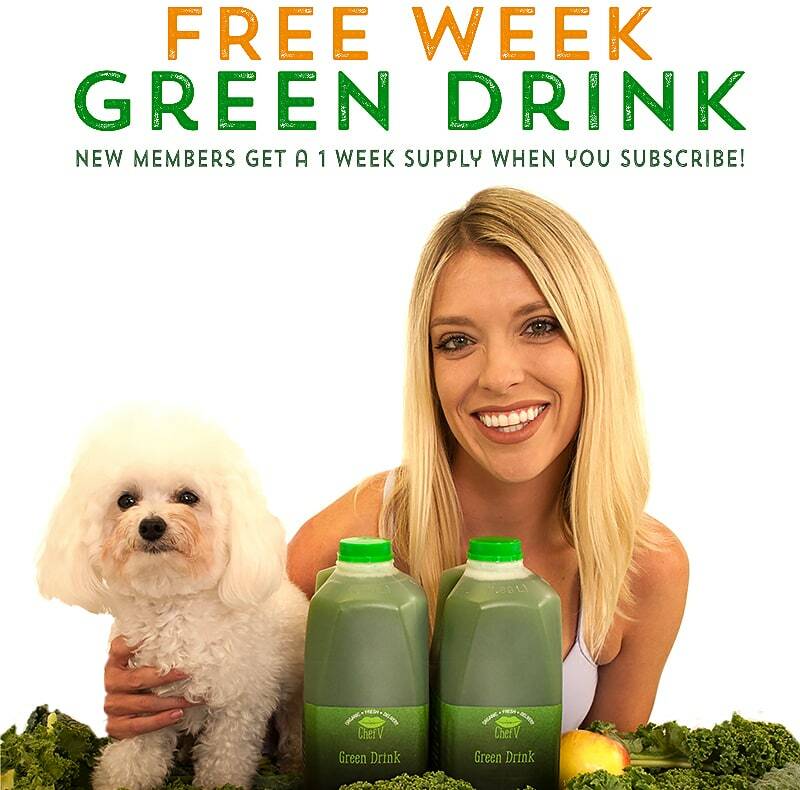 I’ll deliver Organic Green Drinks, Vegan Protein Shakes and Detox Soups right to your front door (not personally, although it would be awesome to meet you).